Start new family traditions this holiday season that will leave life long memories! 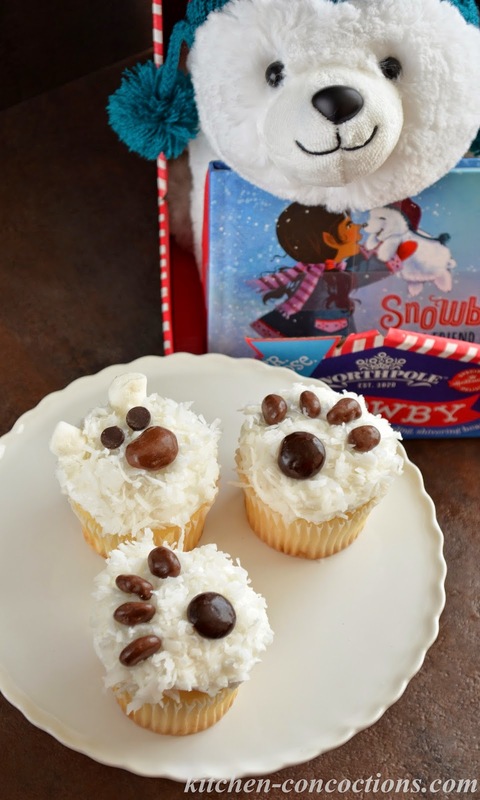 Read Snowby’s New Friend and Once Upon a Northpole Christmas, then make adorable and easy Northpole Pretzels and Polar Bear Cupcakes! When I think of the holiday traditions I grew up with, the first thing that comes to mind are the traditions my Mom always insisted upon and was super enthusiastic about. A real, live Christmas tree (that most years we tried to go to a Christmas tree farm to cut down ourselves), decorating sugar cookies, matching Christmas Eve pajamas and driving around to look at all the holiday lights decking the homes of neighbors. But as I sit and reflect, my Dad had special traditions of his own. From taking us to see The Nutcracker every year, to letting us sleep on the blow up mattress right next to the tree, to letting us pick out a special holiday ornament (ornaments that now adorn my own tree), to the large collection of holiday themed books that we read the weeks leading up to the big day. Now Eric and I have taken these traditions (and the ones from his childhood) and created our own. Decorating gingerbread houses, picking out special ornaments for each other, taking a stroll through the Trail of Lights all bundled up on a cold December night. One tradition that my sister started with her family was 25 days of Christmas books. She wanted to have 25 Christmas books that she would then wrap up, put in a basket and place the basket under the Christmas tree. Each night my nephew would get to pick one book, unwrap it and they would read that book as the bedtime story that evening. When my sister told me of this idea I immediately fell in love with this new tradition. I helped her stock her Christmas book collection my nephew’s first Christmas, and I have even started working on our own collection of Christmas books for when we have babes. Gifting my nephew some books for Christmas is actually not new for me. Since my first nephew celebrated his first Christmas, I have always given a special book for his Christmas gift. This has now carried on to all my nephews and become my own tradition with them. This year, since we will be having our family Christmas celebration a little early, I hope to start another Christmas tradition. You know how much I love creating special treats inspired by books and movies; so when I saw these adorable Hallmark Holiday books at my local Walmart I knew instantly that I wanted to not only gift them to my nephews, but wanted to create a whole day of fun and memories, crafting special holiday treats inspired by these festive books! Both books celebrate the magic the holiday season brings children young and old. One book, Once Upon a Northpole Christmas, is about sharing holiday cheer and that the happiness of families, as they make memories together, powers the Northpole. The other book, Snowby’s New Friend, is about a baby polar bear who can’t stay warm until he meets a generous elf who gives him a hat. Both books come in special holiday gift packs, Once Upon a Northpole Christmas comes with a lighted snowflake ornament “so Santa can find you” and Snowby’s New Friend comes with a Snowby stuffed bear to cuddle with. 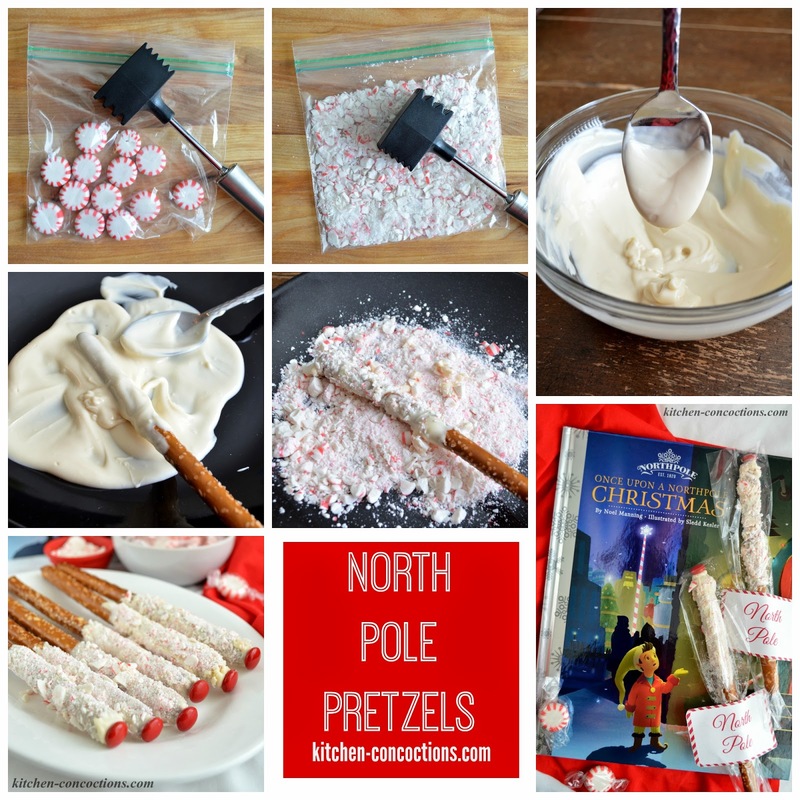 Inspired by the books, I created these cute Northpole Pretzels (Peppermint White Chocolate Covered Pretzels) and super easy Polar Bear Cupcakes. I hope that reading these special books and creating these fun treats with my nephews will become traditions and memories that last a lifetime! 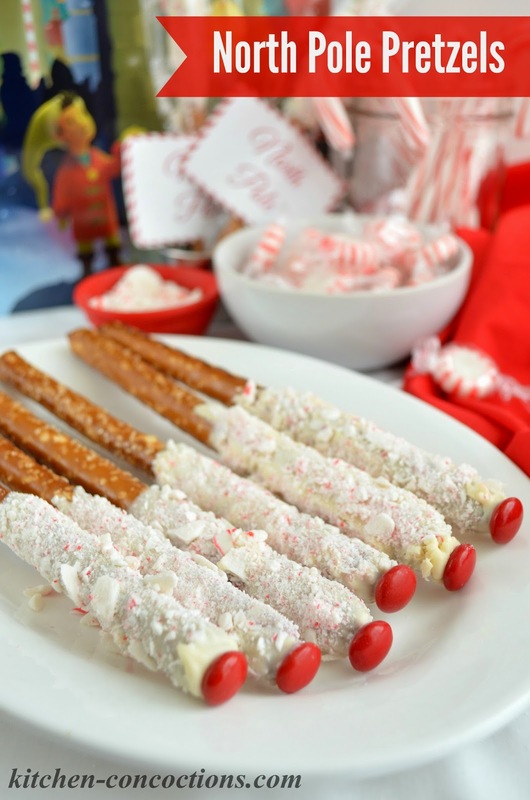 White chocolate covered pretzels with peppermint pieces decorated to look like the North Pole! Line baking sheet with wax paper. Set aside. Place peppermint candies in food processor. Pulse several times until coarsely crushed. Alternatively, place peppermint candies in a large resealable plastic bag. Seal bag tightly. Using a rolling pin or meat mallet, pound until candies are coarsely crushed. Sprinkle crushed candy onto a plate or over a separate sheet of waxed paper and set aside. Place vanilla almond bark and oil in a microwave safe bowl. Microwave for 30 seconds, stir and return to microwave, heating for an additional 30 seconds. Repeat melting and stirring process until almond bark is melted and smooth. Pour melted almond bark onto a plate or into a shallow dish. Working quickly, roll pretzel rods in melted almond bark, covering only about half the pretzel; allow excess almond bark to drip off. 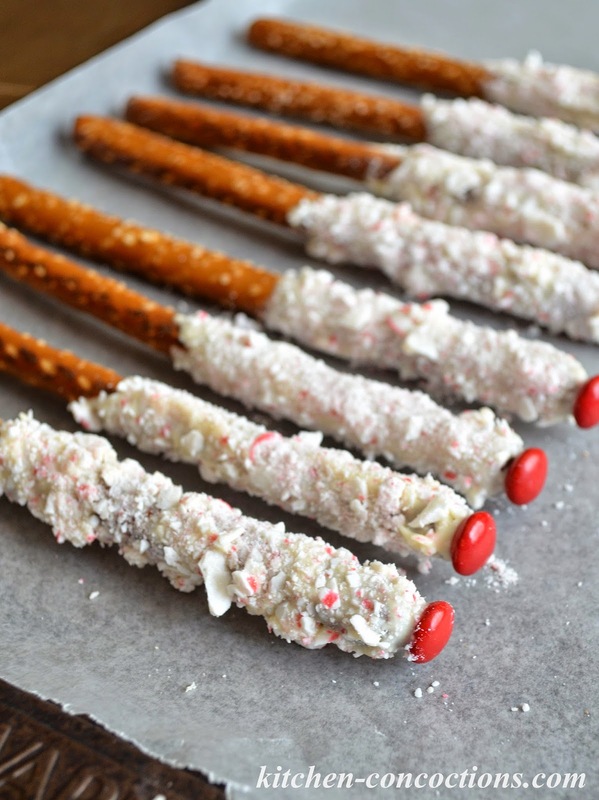 Roll almond bark covered pretzel in crushed peppermint candies. Place one round red or white candy on the top of the pretzel. Place covered pretzels on prepared sheet. Let stand until set, about 30 minutes. 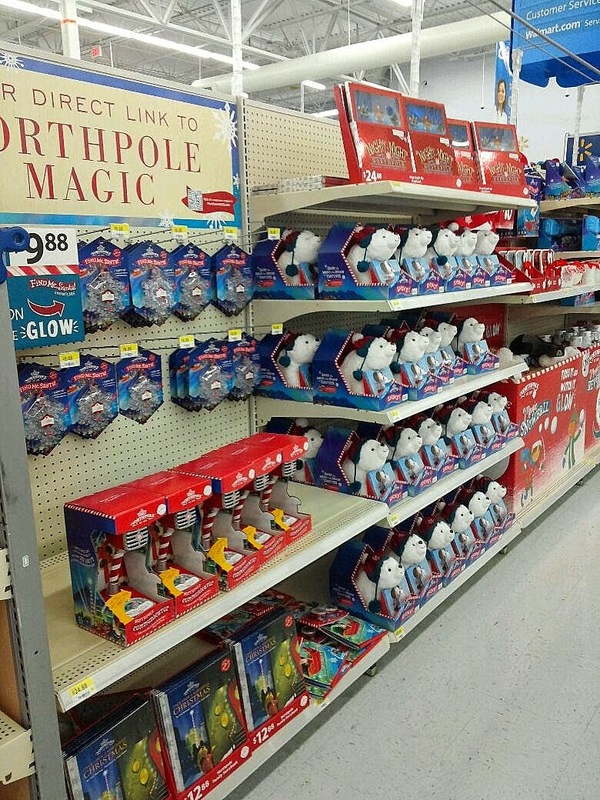 Meanwhile, cut out North Pole printable. Using clear tape, adhere one twist tie to the back of one North Pole sign, leaving enough of the twist tie on both ends to secure to the pretzels. Repeat with remaining twist ties and signs. Once pretzels have hardened, place in plastic pretzel bag. Secure bag with twist tie adhered to the paper North Pole sign. 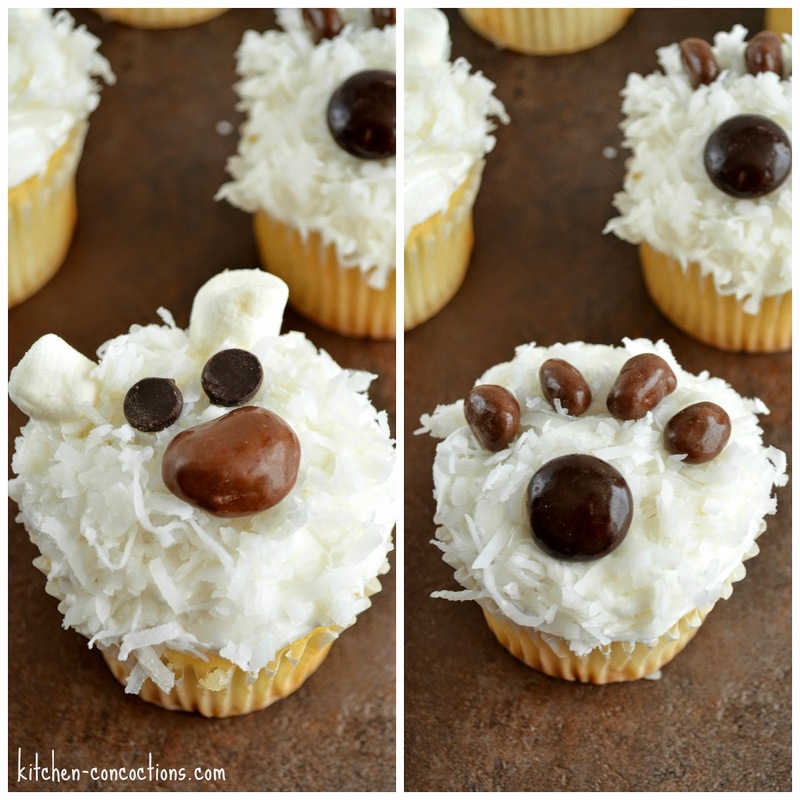 Basic vanilla cupcakes with vanilla buttercream frosting easily transformed to look like adorable polar bears! For Polar Bear Face Cupcakes: Spread approximately 1-2 tablespoons vanilla buttercream frosting in a thin layer on baked vanilla cupcake. Place coconut flakes in a bowl and dip frosted cupcake in coconut flakes to cover. Place one marshmallow, on top of the coconut covered cupcake, in each corner on the same side of the cupcake to form ears. Just below the marshmallow ears, place two chocolate chips (pointed side down) side by side in the top center of the cupcake to form eyes. Right below the eyes, top cupcake with chocolate covered caramel candies to form nose. 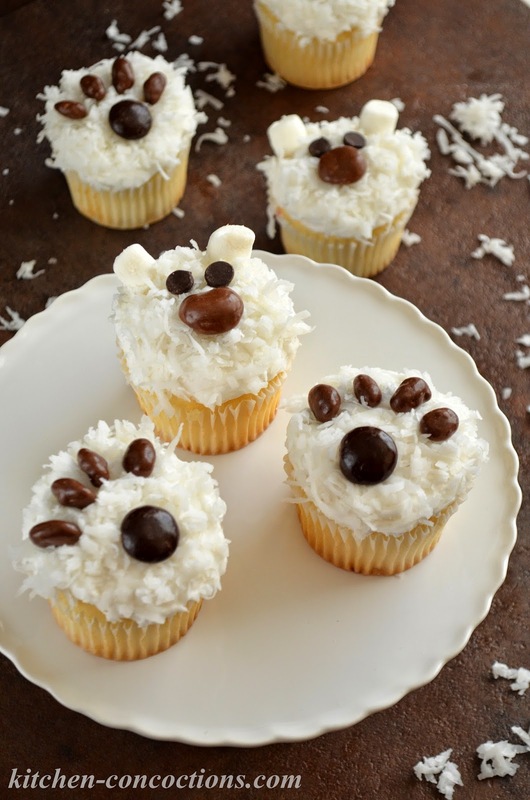 For Polar Bear Paw Prints: Spread approximately 1-2 tablespoons vanilla buttercream frosting in a thin layer on baked vanilla cupcake. Place coconut flakes in a bowl and dip frosted cupcake in coconut flakes to cover. Place one mini chocolate peppermint candy or chocolate sandwich cookie in the center bottom of the coconut covered cupcake. Place four chocolate covered raisins above the mini chocolate peppermint candy, spacing the candies apart, to form paw print. *NOTE: No time to bake cupcakes? Order a dozen cupcakes from your favorite local bakery or grocery store bakery. Most bakeries don’t mind packaging up the frosting in a small container and leaving the cupcakes plain and undecorated. Just let them know when placing your order (usually most bakeries need 24 hours notice) that you will be frosting the cupcakes yourself and want plain cupcakes with the frosting on the side! 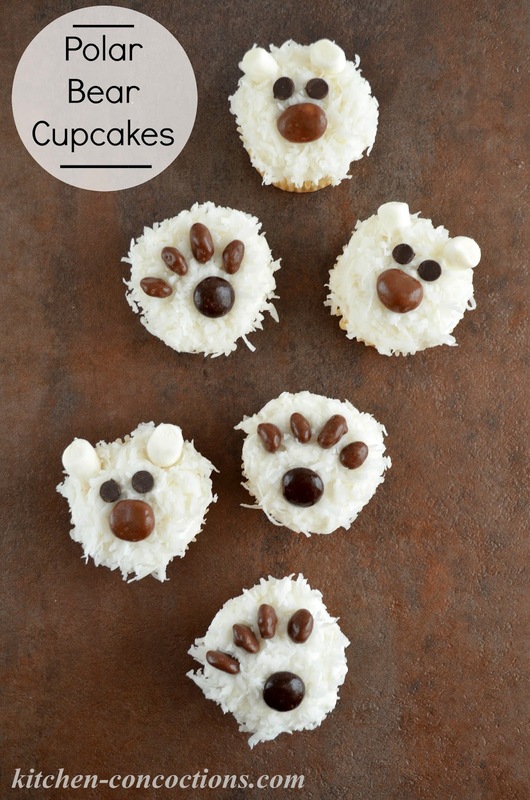 Those polar bear cupcakes are just too cute!